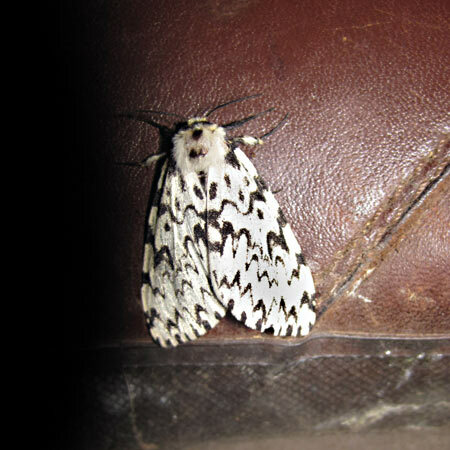 This moth was spotted resting on a pair of boots on one of our Fundamental Bushcraft courses earlier this month. Can anyone identify it? The first person to leave a comment with the correct answer will win a £10.00 Woodlore Voucher. As many of you have pointed out, this moth is in fact the Black Arches moth (Lymantria monacha). Siegfried was the first to answer correctly, winning a £10.00 voucher, but well done to everyone who got it right. This entry was posted in Competitions on August 16, 2010 by Woodlore Team. That looks like a Black Arches – a beautiful moth indeed. Yet to have one visit one of my tilley lamps. Well done as its a stunning looking moth. Not sure if this is right. The wing colour and pattern seem similar but the antennae look different. It’s a Lymantria monacha or Black Arches! Nice Photo! It looks like a gypsy moth. I think it’s a female gypsy moth. It is the Lymantria monacha or commonly called Black Arches. Well I had to look it up, but I think the answer is Black Arches Lymantria monacha. It’s natural habitat is woodland in the south east so that seems to fit. looks like black arches (Lymantria monacha). is that right? The moth is a female black arches. Looks like a Black Arches to me. I stand corrected I think its a Black Arches. Is it a Black Arches. Black Arches moth. Nice one! I think it might be the Black Arches (Lymantria monacha). This is a Black Arches moth. It has a wingspan up to 54mm and is found mainly in the south of the UK from July to September. The caterpillars feed on oak leaves. Distributed throughout the southern half of Britain, chiefly in woodland habitats, the adults fly in July and August. The larvae feed in the spring, usually on oak, but sometimes on coniferous trees.